The SeaSpyder is simply an elevator. It is however adapted to the specific requirements of offshore transfer. Fully compensated to the motion of the nearest end-station in both vertical & horizontal direction. This avoids any chance of impact, collisions or uncontrolled events thereby ensuring the safety of the passengers. The SeaSpyder is inspired by a spider building the first strings of his web in between 2 moving branches of a tree. Instead of a sticky, stretchy silk thread a magnet on a magnet pre-tension wire is lowered onto the a steel plate on the deck of the receiving vessel. The tensioned magnet wire drives the passive compensation & provides lateral stability. The cabin is lowered while being increasingly compensated as shown here. Personnel or guests experience a smooth transfer in conditions that are often considered too harsh for personnel transfer using any other available method. The passive compensation method is simple and allows for transfer between fixed to floating as well as floating to floating wihtout any complexity. The self-powered, fully buoyant and guide-wire controlled SeaSpyder fully eliminates relative motions between both the departure as well as the arrival station. The magnetic connection of the guide wire ensures safe mating & safe release withouth putting people in harms way. It is equipped with various fail-safe mechanisms ensuring compliance to manriding related safety regulations such as described in the” guideline of the “Step change in safety | Marine Transfer of Personnel” guideline. Apart from the design a great deal of attention has been paid to the procedures and associated systems. Detailed support for the formulating of your specific manriding/transfer procedures may be provided upon your requenst. 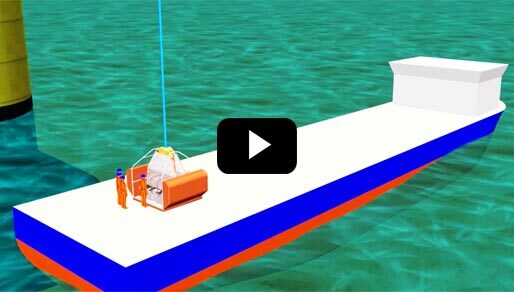 The SeaSpyder enables the asset operator to take full control of the transfer operations. Being independent of dedicated vessels for transfer redefines logistics and enables cost-efficient operations. Many other configurations may be developed for your specific operation. Contact us for more details. The SeaSpyder technology has been developed to flawlessly mimic the dynamics of a spider climbing up or down his first web-thread. The stickiness of the thread ensure the lower tree branch can be connected to. The elastic thread ensures a proper pre-tension, preventing spring-like vibrations, regardless of the branch motion. The elasticity also ensure that the spider can get onto the thread at either end without relative motions, i.e. the risk of his bodyweight and associated acceleration breaking it. So that was the biology behind this innovation. We have developed and patented various ways to mimic this. The crane suspended series 100 is a fully independent self-controlled unit. The connection to the lower of the 2 structures is made by magnet, a sticky line would not suffice. The relative motion control relies mainly on state-of-the-art electro-motors and high-end frequency control units. Energy is stored in the latest technology LTO batteries and any surplus generated energy is stored in super-capacitors to ensure re-use of the energy. The control system will be designed and tested in both numerical and real-world conditions. It shall ensure a safe operation and be redundant in its main features. The SeaSpyder uses state of the art technology giving the capability to operate with sea states up to Hs 3.5 for ships 30-300 m.